Thanks for a fabulous day out on Lake O. We were so exhausted we had to take yesterday off and lie around a bit! Looking forward to seeing Curt's fish on your website at some stage. Tim Releases his first ever caught Tongariro River Brown Trout fly fishing with the Cicada fly pattern on the upper reaches of the Tongario river. The Tongariro river has cleared now after the rain and some good reports are coming in both river, Lake Taupo and Lake Rotoriraia, Lake Otamangakau. 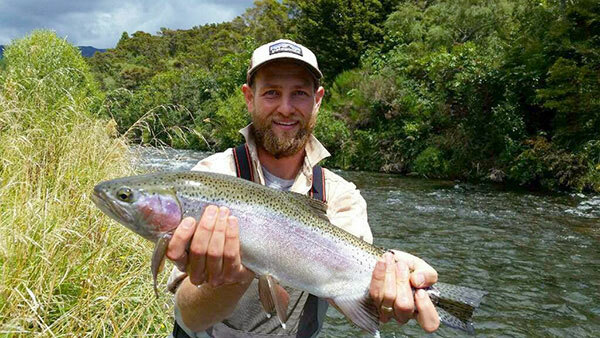 Julian Cribb holds a very solid Rainbow from Lake Otamangakau. 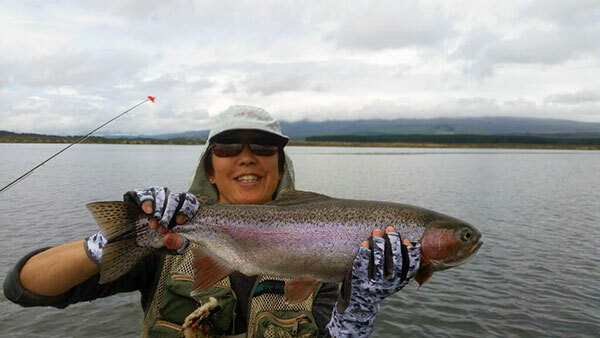 Juith Anne Shizuru from USA, Trout Fishing in Lake Otamangakau, Turangi, New Zealand. 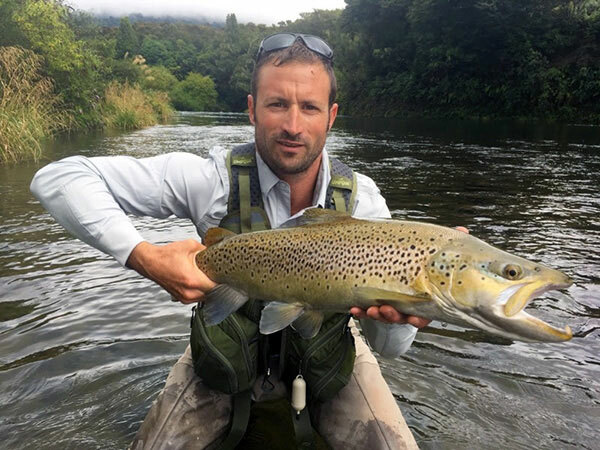 Tauranga Taupo Angler Aidan Wildley desplays two very nice Tongariro river Brown Trout caught on the Tongariro River, Turangi, Lake Taupo, New Zealand. Raining at present here in Turangi, which is great for the land and rivers at this time of year. Trout fishing in the Turangi area certainly has been fantastic over the last few weeks with the Dry Fly Fishing for Trout in full swing on all rivers. The Cicada dry fly has fished well and should continue for for a while. The Tongriro River has produced some wonderfull condition Brown and Rainbow Trout again this season. 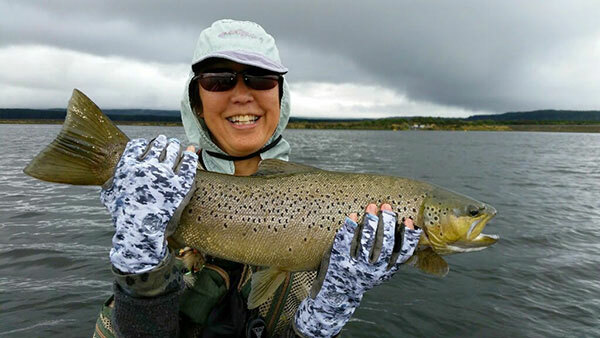 Lake Taupo is fishing very good for many anglers and some top condition trout have been caught fly fishing and boating. It appears as Lake Taupo Trout are getting larger every year. Well done to the Fishery Team at Doc for keeping our Lake Taupo so clean. 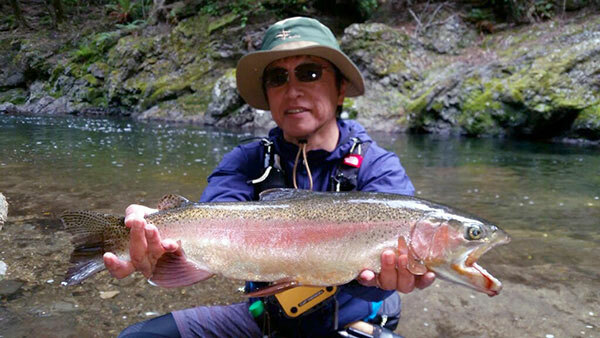 Lake Otamangakau is also producing some very nice trout again this season, this wonderfull small trout fishery keeps on getting better it appears. 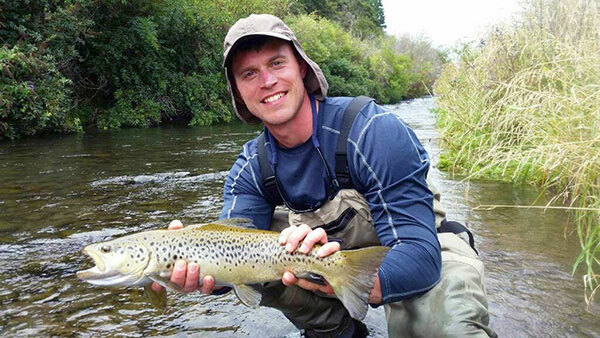 Jamie and Mike stayed at the Creel Lodge in Turangi, while trout fishing the Lake Taupo area here in New Zealand. Jamie holds a nice Tongariro River Rainbow Trout he caught in the upper reaches of the Tongariro river (with the Cicada dry fly). 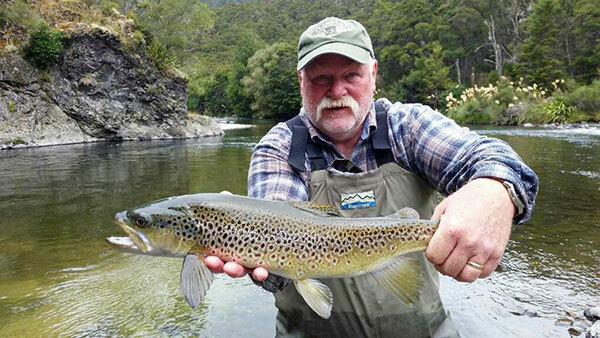 Mike (Jamie's dad) from US holds his first New Zealand Brown Trout he caught on he heli-trip. 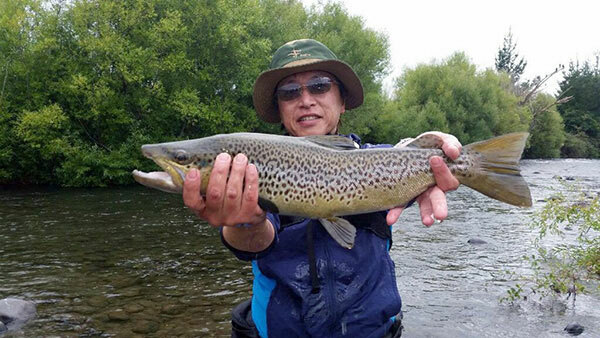 Yoshi and his wife from Japan stayed at the Exctutive Motel in Taupo while here on their Trout Fishing vacation around Taupo and Turangi area, the upper Tongariro river and back country streams in New Zealand. 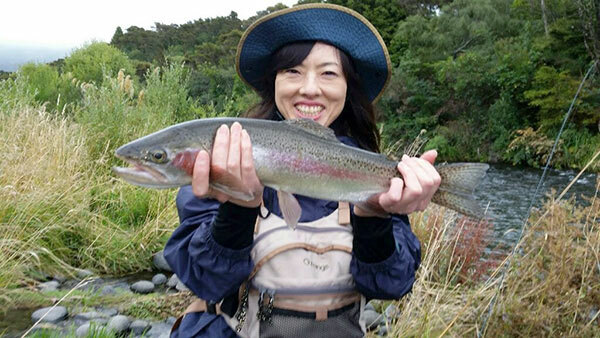 Anglers fishing Lake Taupo Tongariro river Mouth Delta area have been coming home with some great fishing reports of very nice quailty trout caught for the table. Many nice Trout have been caught fishing the streams mouths around the lake after dark as the lakes slowing warming the trout are seeking the cooler waters of the the streams and rivers flowing into Lake Taupo. 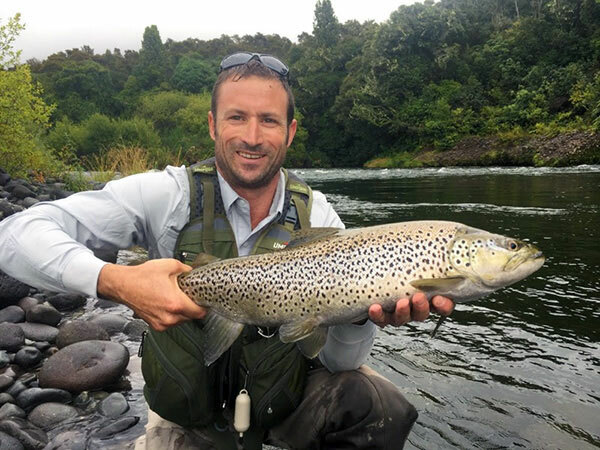 Trout fishing on the Tongariro river has been good with some good fishing reports coming in of anglers fishing the evening rise over the last six weeks, and now the Cicada fly fly is fishing well during the day. Lots of nice browns have arrived in the Tongariro river system for their summer Autume spawing runs. 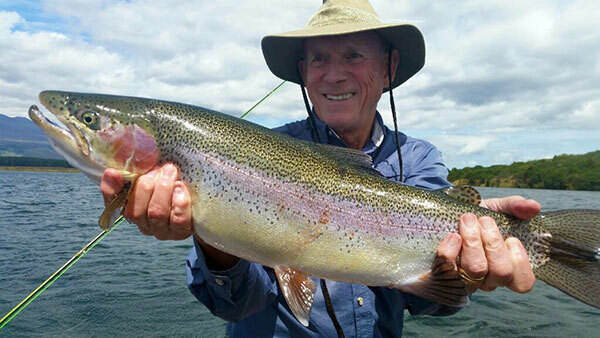 Lake Otamangakaau has been fishing well when the wind has been calm.. an angler caught a fantastic 13lb hen Rainbow a couple of weeks ago we happened to see at Sporting Life fishing shop. Good fishing Reports ofrom Lake Rotoarira and Lake Kuratau when wind has been down.